There are beet-lovers, and beet-haters. If you are the latter, I’m not going to pretend this is the recipe to win you over to the beet camp. You are better off with baby steps and the Swedish classic Biff à la Lindström. This recipe is a decidedly beet-lovers moment and even for that crowd adjusting to the pink in this sandwich can take some time. But I posted a Swedish meatball recipe last week and promised this sandwich as a follow-up so here it is. Pink food is a tough sell unless you are talking about things like fluffy buttercream frosting and cupcakes, OR you have grown accustomed to it. There are two very popular, very pink, pickled beet dishes in Swedish cuisine. One is a salad served at Christmas time made with diced pickled beets and minced pickled herring folded together with whipped cream (I just heard the beet-and-herring-haters screaming in horror from the far reaches of cyber-space). The other is a pickled beet and apple salad that tops an open-faced meatball sandwich as shown above. It is a classic offering on café and restaurant menus for lunch. Open-faced sandwiches are traditional in Sweden and are called smörgås (SMUHR-gohs) which literally means butter goose. The name derives from the time when people used to churn their own butter and little clumps of butter would form on the top, swirling about like geese. A pat of that butter was the perfect size for buttering a slice of bread and the term smörgås developed. A smörgås can be eaten at any time of day and can make up the entire meal at breakfast or lunch. Smörgås eaten at dinner time are generally an accompaniment to the meal such as soup. The only other time in my life that I recall making pink savory food it was a mistake. I had a significant fondue phase a decade ago and one night it was time to branch from the traditional to the unusual with a Zinfandel and white cheddar fondue in one of my cookbooks (since this is a pink-centered post most of you are way ahead of me on this one). I wish I had thought it through myself before spending the time and money on that recipe. The resulting pinkish, burgundyish, grainy sludge didn’t stand a chance. My husband and I each managed to choke down a bite but that was it. It could have been the best-tasting fondue in the world (which it wasn’t) but you just couldn’t get past the color and into the bin it went. In the case of the köttbullar smörgås (SHUHT-bool-luhr SMUHR-gohs), since I was already a beet-lover and had previously been exposed to the Christmas pickled beet and herring salad I embraced it readily. The pink doesn’t even phase me anymore (ok, maybe a little bit) but the taste is a great pairing with any leftover Swedish meatballs lingering in your household. If you are a beet-lover, give it a try. You may just find that pink is your new favorite color. 1. 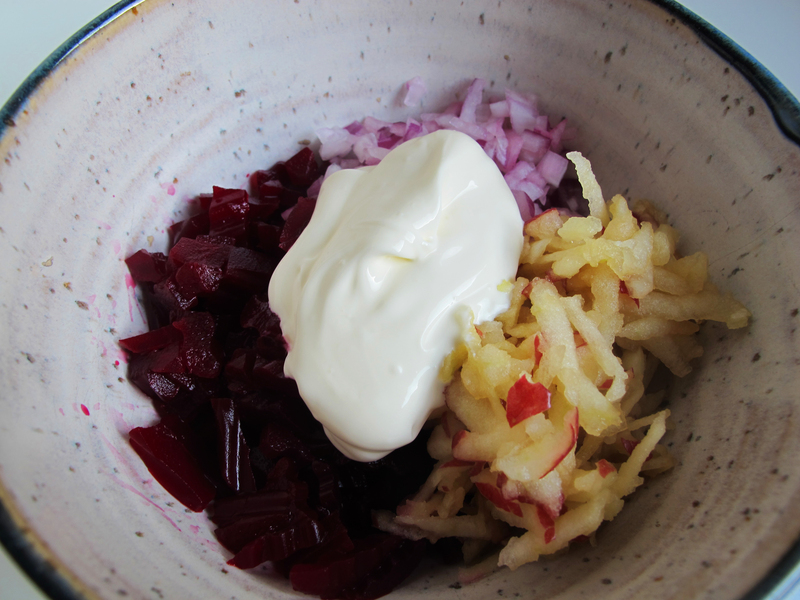 Place the beets, apple, onion, crème fraîche, beet juice, salt and pepper in a bowl and mix together gently with a spoon until well combined. 2. Lightly butter the bread slices and divide the salad greens between them. Place the meatballs on top of the salad greens and divide the pickled beet mixture between the two sandwiches. Serve. 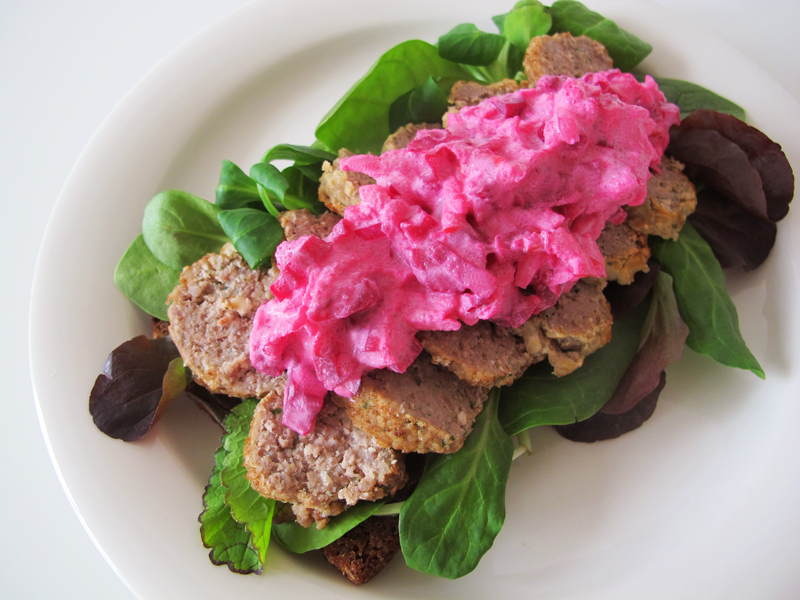 Lovely pink beetroot salad with meatballs, nice colours. I like beetroots boiled and pickled but not the salad. Reminds me of the horrible school food, where we were served Sill ala Russ. Looked pink and tempting but contained beetroot salad with pickled herring, which I still can’t stand. Thanks Eva. I am actually a bit surprised by what shows up on the school lunch menus here. The one that turns my stomach is blood sausage. Ugh. But lots of kids like it. I haven’t seen the beetroot salad on the menu yet, but my kids are still at the day care level. Maybe it will crop up in grade school. Must make more meatballs! Tried them last week…big hit with hubby and friends. We are beet lovers, so now, I have to try the beets. Thanks for the uniqueness of the recipes. Berti! Since you said you were making the meatballs I was trying to hurry up with the sandwich post in case you had any leftover (of course I was gambling that you are a beet lover). Let me know if you give it a try and if you liked it or not. Miss you. With all the Super Bowl recipes out there, I’m thinking this could be promoted as a more feminine sort of meatball fare for the big event. Go… whatever teams are playing! This recipe looks really good! I love the bright color, a nice twist on a family favorite. It’s fun to try something different with meatballs. It’s standard in Sweden, but probably new to a lot of people. Thanks for stopping by and taking the time to comment. It’s funny I’m part Sweedish and the only Sweedish thing I know how to cook is Sweedish Pancakes, which I got the recipe from my grandfather. This looks ace, brings back lots of memories. Many thanks for a great recipe! I made this for a picnic lunch and it was a hit with my pickled-beet loving relatives. I will definitely be making the pink salad again! Thanks for the recipe. I’m so glad to hear your family liked it! Thank you for taking the time to post.